September 12, 2014 by iCepts Technology Group, Inc.
Microsoft Dynamics NAV Enterprise is a popular business management system that can help your company stay connected to vital business processes and information to help grow your business. These below top 4 reason to consider Microsoft Dynamics NAV will give you an idea why companies rely and have made their ERP selection with NAV. 1. In one system, connect people and processes across your enterprise: Microsoft Dynamics NAV is a proven, mature and robust system with the intuitive functionality to connect all areas of your business to gain efficiency and boost productivity. Dynamics NAV’s unique “Roll Tailor Client” give you the tools you use to manage the task that are most relevant to your job function. Easy to customize and rich in reporting, Microsoft Dynamics NAV gives you timely and relative information to help you work faster; a key criteria with ERP selection. 2. Access your work where you're needed most: The traditional workplace isn't so traditional anymore, and business doesn't stop because you're on the road or working from home. Monitor your business, collaborate on documents, enter and approve transactions—all from your phone, tablet, or desktop. 3. A Continually Improved ERP System that is trusted worldwide: Microsoft Dynamics NAV Enterprise is used by over 100,000 companies worldwide; making it the most popular ERP system worldwide in the mid-market space. 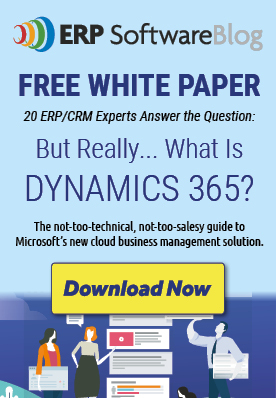 In addition, Microsoft Dynamics is one of the few ERP systems on the market today with a published “statement of direction” for future enhancements and product releases.